You are here: Home / Trusty Tails - About Us / Group Dog Walk vs Solo Dog Walk? Well, we’re here to tell you that it is entirely up to you. With lots of pups in all of our service areas, there’s no shortage of canine companionship available for your best furry friend to enjoy. We don’t use belts, leash splitters, or go on enormous pack walks, though; our staff will happily take out up to four dogs at a time, which is enough company for everyone involved, but nothing that could get out of control. You won’t see our walkers being dragged down the street after a squirrel. However, you might see us out for a high-energy jog to get some tails wagging! There are many benefits to walking in groups or ‘packs’ together. One of the most important benefits for your dog gets a chance to socialize with other dogs. How do we form groups? A lot depends on you and your dog’s needs. If your pet is friendly with others, it’s fairly easy to find a compatible group to take a stroll with in your neighborhood. Who needs a dog park when you can get some great fun and socialization in with a comfortable crew of puppy pals? However, if your pooch would rather spend time with a walker one on one, or perhaps has special medical or behavioral needs you’d like us to attend to, we’re more than happy to take her out on her own. Just specify, “solo walk” when scheduling your visit, and we’ll be sure to keep it to just the two of us on our outing. We also take into consideration the energy level of the dog and requested duration of the walk. With visit lengths ranging from thirty minutes to two hours, there’s plenty of variety in the types of walks we take. Some dogs like a fast paced stroll, even jogging along the walkways when safe to do so, while others may prefer a slower outing to sniff about and meander along the sidewalk. We’ll make sure that your pet is matched with a group where all dogs are on approximately the same level of health and energy in order to maximize their enjoyment, whether we go two blocks or two miles. Best of all, group walks often last longer than the requested amount of time at no additional charge to you; not only do we want to have as much fun as possible with your pets, we want them all to make the most of their time too! Will my dog always walk with the same group? For the most part, once your pet is incorporated into a “pack,” the members will be kept relatively consistent. We can’t promise that their furry friends won’t move to another area of the city, take a sick day, or change their schedule, but we’ll always do our best to keep your dog happy with his walking mates. A sense of camaraderie and consistency help to make for the best experiences! Give us a call or email today, and we can find a great fit for him in your neighborhood. You’ll know they’ve found a new buddy the next time you go for a walk together and you’re led to their best furry friend’s front door! There are a number of benefits to having your dog walk alone. 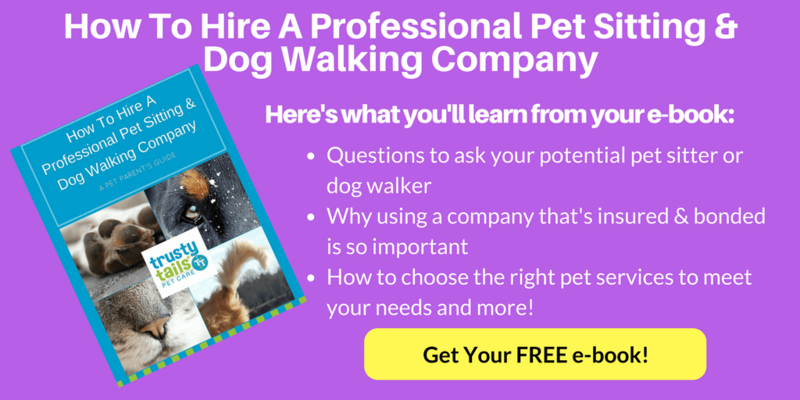 Perhaps you would prefer for your pet to have his or her own personalized time with their walker. If your dog likes to ‘smell the roses’ along the route with frequent stops, a solo walk may be the best way to go as to not hold up those walking in a group. who likes to stop and smell the roses along the walking route. If you have a reactive or aggressive dog who doesn’t get along with others, we can walk them alone as well. Either way, solo dog walk vs group dog walk, there is no right or wrong. Trusty Tails is here for you and happy to work with you to find a walking routine that provides your dog with the best walking experience. What is most important is that your dog gets out on a walk during the day for some exercise, a bathroom break and some mental stimulation. We’d love to hear from you. 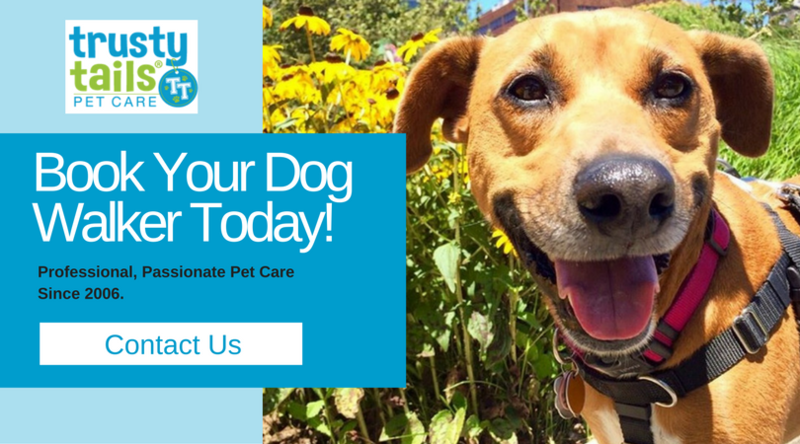 Contact us today at 201.232.9435 or bark@trustytails.com or reach out via our contact us form. We look forward to hearing from ya.